It’s probably the most-lived in room of the house…the family room. (At least it is in our home!) In this room, our family plays games, reads, practices piano, scrapbooks and just plain hangs out. 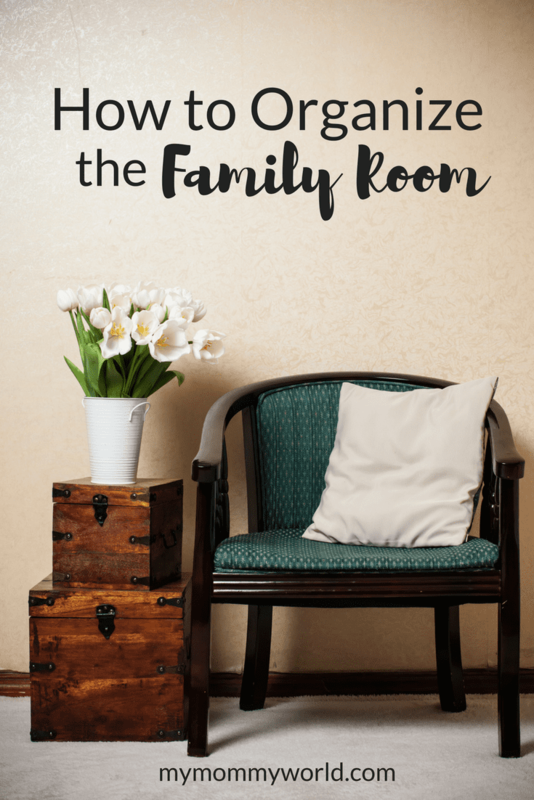 With all that activity taking place, it’s important to figure out how to organize the family room. Just like with the kitchen, we first need to figure out what goes on in this room before we try to organize it. In our home, we have a different family room layout than most homes. We have a split level, which means that we have a tiny little sitting room right off the dining area, and a bigger family room, which we call the playroom, down a small staircase. The sitting area is where I sit every morning for my quiet time, and the rest of the family sits here while waiting for dinner in the evenings, usually while reading a book or just talking. 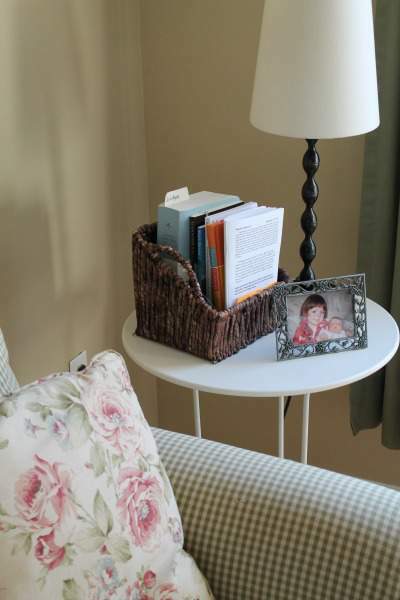 I keep my quiet time books in this cute little basket that I found at Hobby Lobby last year. I love how many books I can fit inside, along with my Bible, as I’m usually reading more than one book at a time. 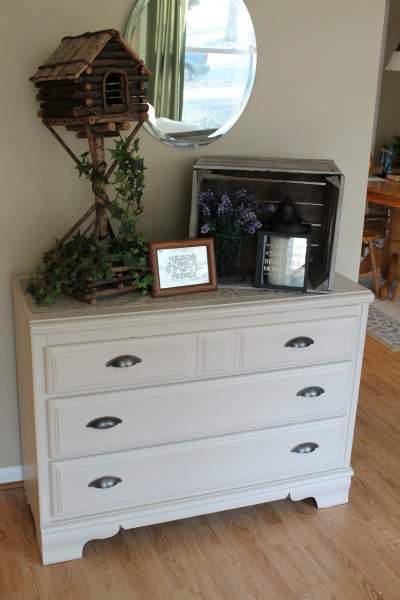 This small dresser used to sit in my husband’s room as a boy; I painted it to coordinate with our family room and added new drawer pulls to use as storage in this area. I organize all of my note cards, batteries, mailing labels, instruction books/manuals and other miscellaneous papers in this dresser. Because the drawers are so large, it was important to use containers to keep everything from sliding around and getting jumbled up together. These particular organizers are technically for the refrigerator, but because they are long and small in height, they were a perfect fit for this drawer. We keep most of our kids’ toys and games in the playroom side of our family room. When the kids were smaller, this room was filled with ride-ons and those big toddler toys. I’m so glad those days are behind us now…seeing toys all over the place always made me feel like everything was out-of-order! Nowadays, we have big things corralled in a big toy box, and small things like Barbies and Matchbox cars stored in big plastic bins from Ikea. Our son has really come to love playing board games in the past year, and we have really been collecting them at each birthday and over Christmas. I think the best way to organize games is to keep them inside the original boxes and to stack them on a bookshelf. We use this small bookshelf for our games so that our kids can reach them easily. I’ve seen other moms take the game parts out of the boxes and store them in large zipper bags or stacking plastic containers. This is a great idea if you are short on space, but if you have a game board, for instance, that doesn’t fit in the bag or box, then what do you do? I’d rather have everything in one container. In an effort to cut down on the clutter that we accumulate, and to save money, we stopped buying DVDs a while ago. Years ago, when we liked a particular movie or TV show, we would go out and buy the DVD so that we would always have it to watch. Unfortunately, we ended up getting rid of a lot of these DVDs because we either outgrew them (in the kids’ case) or grew not to like those particular movies anymore. When I thought about how much money we had wasted…because you can’t really sell old videos for anything worthwhile…I decided it was better to just rent future movies from Redbox, Amazon Prime (affiliate link) or check them out at the library. For the DVDs that we ended up keeping, I bought this disk organizer to keep everything in order. I love how many disks you can store inside, and it saves so much space because you can get rid of the bulky case and still keep the disk safe from scratches. It’s also easy to find whichever disc you are looking for when you are ready to watch the it. I am such a huge book lover that it pains me to say this, but I try not to buy books anymore. It’s the same sad thing as the DVDs…when you are done with a particular book, it’s hard to sell it, plus they take up a lot of space. Our book collection was such a source of pride to me at one time, but about 10 years ago, when my husband received orders to a base in England, we decided to sell a good deal of our books, because we would not have been able to take them with us. When we only got about $10 for 6 big boxes of books, I realized that, while they were a good investment in our brains, the books were not a good investment for our bank account. That being said, the best way to organize books are on shelves, because they take up less room, and the titles are easily seen. We have these great built-in bookshelves in our family room, but my neighbor, who does not have built-ins, was able to get a beautiful set of bookshelves at Ikea, which totally look like built-ins for her family room. That’s it for the family room…next week we’ll try to tackle the bathroom! Do you find it a challenge to organize all the stuff that goes on in your family room? These are great tips, Erin. We recently put in bookshelves in our family room. It really does help to keep them looking neat. I also have shelves with bins for all those small items, to keep everything looking neat. Just a little organizing can make a big difference.